Two athletic congresswomen decided one game isn’t enough. Reps. Nanette Barragán of California and Mia Love of Utah will play with their female colleagues against the media in the Congressional Women’s Softball Game. And both are also on their parties’ rosters for the Congressional Baseball Game, which pits Democratic lawmakers against their Republican counterparts. Love, 42, will be making her baseball debut next month, when she’ll be the only woman on the GOP team. She usually goes to two baseball and two softball practices each week — on one morning, she goes to both. Baseball practice usually starts earlier than softball. Love, who also regularly goes for a run in the morning, said she is putting in the effort to be a good role model to children. “My kids love to come and watch these games. It’s good for us, when we’re looking at what’s happening in our country, it’s nice for kids to see adults, especially members of Congress, being nice to each other and coming together,” she said. This year marks Love’s fourth softball game. As the only woman in the Utah delegation, she said she “felt like it was important” to represent. She was asked the join the baseball team by friends who are on it. “Mark Walker, who is a really good friend of mine, will be pitching and we’re planning on him to bring in the victory,” she said, before adding that Democratic pitcher Cedric L. Richmond of Louisiana is also a good friend. By participating, Love said she hopes to show that “no one is shying away” from the game after five people, including House Majority Whip Steve Scalise, were shot at the GOP baseball practice last year. Barragán, 41, alternates between baseball practice on some days and softball on others. “I get a little grief from both sides because I don’t go to enough practices for both teams. But I really enjoy it if I can help one team or the other, that’s really what I want to do,” she said. In baseball, Barragán plays second base but is known on the team for her speed. So she thinks she could be a utility player for the softball squad. “I play really wherever they want me, wherever they need me. I play everything from outfield to second base. This year I’m hearing they may want me at short, so wherever the ladies need me, I will play,” she said. 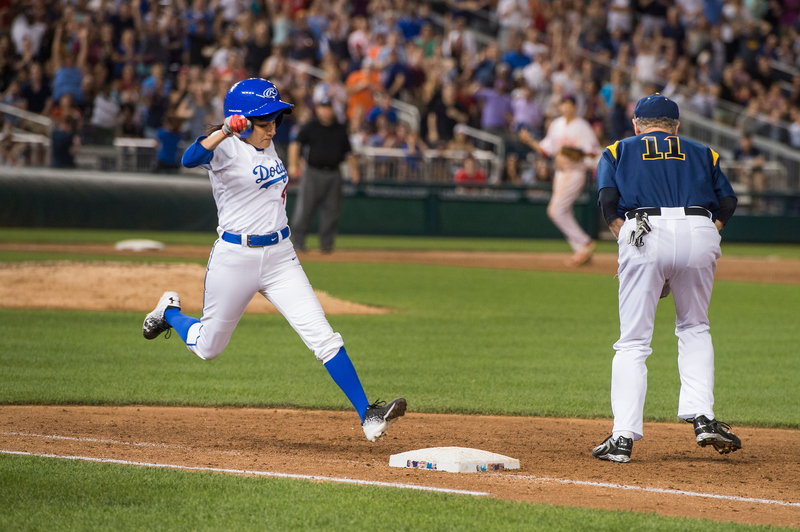 California Rep. Linda T. Sánchez was the other female member on the Democratic baseball team last year. But she won’t be playing this year — only the second game she has missed since she started playing 15 years ago — after she broke her hand while at home in California over the recess. She missed the 2009 game because she had just had a baby. The baseball game is on June 14 and the softball game is on June 20.